Oils of plant origin have been predominantly used for food-based applications. Plant oils not only represent a non-polluting renewable resource but also provide a wide diversity in fatty acids (FAs) composition with diverse applications. Besides being edible, they are now increasingly being used in industrial applications such as paints, lubricants, soaps, biofuels etc. In addition, plants can be engineered to produce fatty acids which are nutritionally beneficial to human health. Thus these oils have potential to 1) substitute ever increasing demand of non –renewable petroleum sources for industrial application and 2) also spare the marine life by providing an alternative source to nutritionally and medically important long chain polyunsaturated fatty acids or ‘Fish oil’. 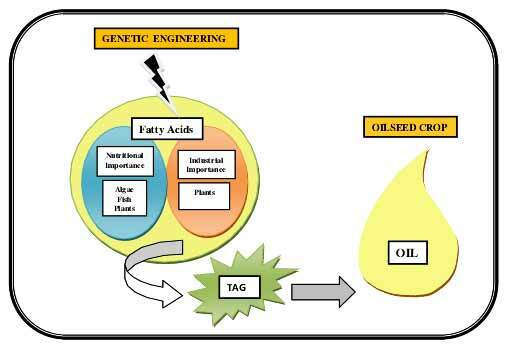 The biochemical pathways producing storage oils in plants have been extensively characterized, but the factors regulating fatty acid synthesis and controlling total oil content in oilseed crops are still poorly understood. Thus understanding of plant lipid metabolism is fundamental to its manipulation and increased production. This review on oils discusses fatty acids of nutritional and industrial importance, and approaches for achieving future designer vegetable oil for both edible and non-edible uses. The review will discuss the success and bottlenecks in efficient production of novel FAs in non-native plants using genetic engineering as a tool. Omega-3 fatty acids, Hydroxy fatty acids, Stearidonic acid, γ-linolenic acid, Oleic acids, Erucic acid.